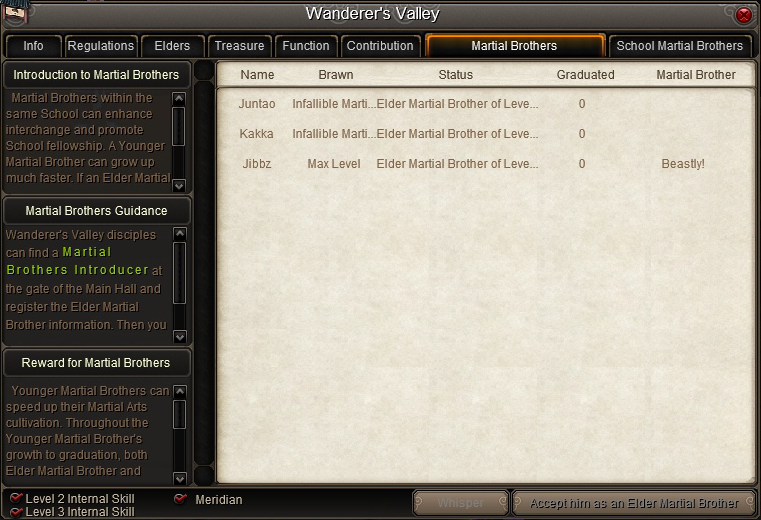 The martial brother mentorship system allows players who have fully levelled their school’s 2nd or 3rd internal to assist newer players and help them advance. Basically, you find a player in your school who you get along with and send them (the “Elder Martial Brother”) a request to take you as a student (termed “Younger Martial Brother). Both players will be greatly rewarded for participating in the program, it’s mutually beneficial, and one can avoid a lot of grinding by becoming a student! The younger martial brother must not be too far advanced in their own internal (generally don’t even start the internal that you wish to learn) & must be in the same school as their mentor. The elder martial brother must have achieved a level of 36 in the internal that they plan to teach, and can only take on two students at a time. The third kind of Mentor is the Meridian teacher. To become a Meridian teacher, one must clear 16 acupoints and finish 360 levels of accumulated meridians. To become a Meridian student, one must open 3 acupoints, but not open more than 10. Alternatively, one can find their school headmaster. 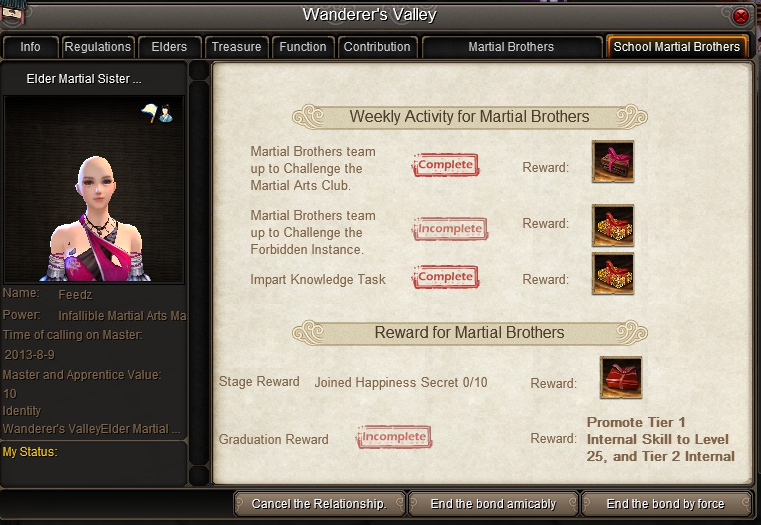 Nearby will be a School Martial Brother Guide. Talk to him and choose the “I want to enter my name in the Guild” there one can enter their name into the guild tab registry. Third, both mentor and student will enjoy a health & defense buff. 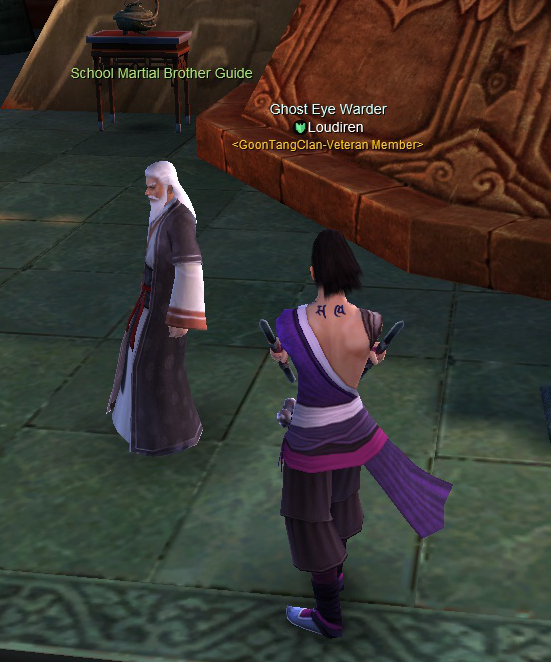 One may end the ‘bond’ between teacher and student by clicking any of the 3 buttons at the bottom of the School Martial Brothers tab or by speaking to the Guide near the headmaster and choosing the “In my opinion, I am good enough to end my apprenticeship” option. Good luck with your levelling!